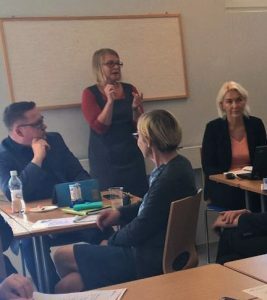 EUMASLI – European Master in Sign Language Interpreting – is an innovative international master study programme that is intended to contribute to the development of the professional field of interpreting between deaf and hearing people by bringing together sign language interpreters from across the world. It aims to prepare participants for research, development, and management functions in their respective countries. For any questions, contact the programme coordinator Graham Turner. Follow what’s been said of EUMASLI on social media, #eumasli and #eumasli3. EUMASLI started out as an EU-Erasmus curriculum project (2006–2009), and was first implemented with 16 participants from 8 countries from 2009 to 2011. 21 participants from 10 countries came together for the second round of the programme from 2013 to 2015. Read more about the rationale of the programme, some of its starting points, its module structure and its organisation: Programme. 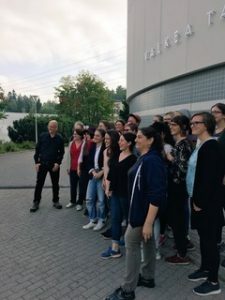 The third cohort started in January 2017 with 23 participants from 12 different countries who are scheduled to defend their theses around the EFSLI annual meeting in Sweden in September 2019..
EUMASLI 3 is run by Heriot-Watt University in Scotland, Humak University of Applied Sciences in Finland and Magdeburg-Stendal University of Applied Sciences in Germany. Over the period of 2.5 years, students travel to participate in block-seminars at all partner universities and engage in online activities and self-study. Since 90 ECTS credits (i.e. the equivalent of 2,700 student working hours) are to be obtained, the work load is considerable. You find more information on the curriculum and information on the application and fees in respective pages.